With the new Companies Act 2013 requiring more women on boards of directors, Professors Jayati Sarkar and Ekta Selarka examine a sample of companies to gauge the extent of female representation on their boards. Compliance with the law is not a straightforward matter, they argue, given high female attrition at the top rungs of the corporate ladder and the dangers of tokenism. Moreover, the looming question of the relationship between board gender diversity and corporate governance and performance bears closer examination. The increased focus on greater board diversity by policy makers, company managements, company shareholders and other stakeholders has been driven by the growing realisation that director demographics such as educational background, industry experience, social connectedness, gender and race that go beyond director independence could have an impact on corporate governance and company value. The most important of these demographics is gender. The spotlight on gender in the boardroom has been motivated by two considerations: first, the stark statistics emerging from various developed and developing countries point to the dismal presence of women on company boards. Second, there is growing recognition that women have characteristics distinct from men that could potentially contribute positively to company performance and governance. Select empirical and anecdotal evidence does support this hypothesis, but there are also studies suggesting that gender could negatively impact performance or have no effect at all (Adams and Ferreira, 2009; Ferreira, 2010; Farrell and Hersch, 2005). In view of evidence that gender could matter in governance and performance, a sizeable number of countries, both developed and developing, have promoted gender diversity through legislation, regulation and governance codes. India has been the latest to join this group, introducing a mandatory quota for women on the corporate boards of public limited companies in the new Companies Act, 2013. In India, as in most other countries, women have been consistently under-represented on corporate boards. This is reflected in both absolute and relative terms, the former in terms of the less than 5% of board seats held by women in large Indian companies, and the latter in terms of India’s low rank with respect to gender diversity when compared to a large cross-section of countries (Catalyst, 2013). In a bid to increase the representation of women directors, Section 149(1) of the recently enacted Companies Act, 2013 (Ministry of Corporate Affairs, 2013) in India requires that a prescribed class of companies have at least one woman on their board of directors. The objective of this note is to examine the incidence of women directorships in a sample of large listed Indian companies that are on the cusp of implementing Section 149(1). The period of study is 2003-2012, with the year 2003 marking the adoption of Clause 49 of the Listing Agreement by all listed companies, under which such companies had to disclose their corporate governance practices. The analysis is conducted for companies listed on the CNX 100 stock index, which are the most actively traded on the National Stock Exchange (NSE) and contribute to more than 70% of total market capitalisation and 79% of the traded value on the NSE. The data is culled from the corporate governance reports filed under Clause 49 and obtained from the Prowess database of the Centre for Monitoring Indian Economy. By all accounts, women are under-represented on company boards in most countries. According to a survey by Catalyst (2013), the most cited data source for the presence of women in management positions, the proportion of women on company boards across a sample of 44 countries varied from 40.9% in Norway to 0.1% in Saudi Arabia. Several of the countries in the list, starting with Norway in 2005, have successively introduced gender quotas through legislation. To put the gender gap in Indian corporate boardrooms in perspective, one might consider estimates that show that while women comprise 36% of the labour force in India and 26% of the workforce in the corporate sector, only 3-6% of women account for senior management positions and 4.7% hold board positions (Catalyst, 2013). This phenomenon of female attrition further up the corporate hierarchy, dubbed as the “leaking pipeline” is widely prevalent in India, placing it among the lowest of its Asian cohorts (McKinsey 2012; Community Business, 2011). McKinsey, (2012), for instance, reports that while 42% of entry-level graduates in India are women, only 29% among entry-level professionals are women; thereafter women’s participation sharply drops as one moves up the ladder. The percentage of women in mid- to senior-level management positions, on executive committees, serving as chief executive officers (CEOs), and holding board positions estimated at nine, three, one and five, respectively. While the leakage in other countries is the highest between middle- and senior-level positions, in India, this attrition takes place much earlier – between junior- and middle- level positions (Community Business, 2011). Low female participation in top-level corporate jobs in India is, as elsewhere, due primarily to the “double burden” of job responsibilities and family responsibilities, and the struggle to strike a work-life balance. In addition to this, cultural norms that see women primarily as caregivers and homemakers and in- built gender biases are stronger in traditional societies like India than in developed countries. These factors, coupled with the absence of adequate support systems, militate against the greater participation of women at all levels of corporate management. In fact, survey statistics show that such factors are among the strongest in India, forcing women to voluntarily quit jobs early in their careers to tend to family responsibilities (Community Business, 2011). Why Have Women on Boards? The prevailing business case for gender diversity on boards is that women have intrinsic characteristics and a management style distinct from men; thus, the skills of both genders can complement each other to improve the quality of corporate governance and positively impact financial performance. Empirical evidence in this regard, however, is mixed. Some studies show that while women on boards positively impact the quality of governance as they are less likely to have attendance problems than men and are more likely to hold CEOs accountable for poor stock performance, the flipside is that greater gender diversity can negatively impact financial performance (Adams and Ferreira, 2009). In contrast, other accounts (Davies, 2011) point to a considerable body of evidence indicating that having women on company boards leads to better financial performance. The relationship between gender diversity and governance and performance is likely to be more uncertain in countries like India that are dominated by firms with ownership and management control concentrated in the hands of family members. In such cases, if women are to occupy executive or affiliated board positions, many such positions, as in the case of their male counterparts, are likely to be relationship- based and not necessarily decided through merit-based selection. This could in turn have different implications for the costs and benefits of gender diversity and its relation to the quality of governance and company performance. Low female participation in top-level corporate jobs in India is, as elsewhere, due primarily to the “double burden” of job responsibilities and family responsibilities, and the struggle to strike a work-life balance. In addition to this, cultural norms that see women primarily as caregivers and homemakers and in- built gender biases are stronger in traditional societies like India than in developed countries. In India, while corporate governance reforms started in earnest with the institution of Clause 49 by the Securities Exchange Board of India (SEBI) based on the Kumar Mangalam Birla Committee’s recommendations, it was not until the enactment of the Companies Act, 2013 that gender diversity on corporate boards received any attention. Instead, the primary focus of policy makers with respect to reforming the functioning of corporate boards was to ensure board independence. Gender diversity has since come into focus, with Section 149(1) of the Companies Act, 2013 requiring companies to have at least one woman director on their boards within a stipulated time period. 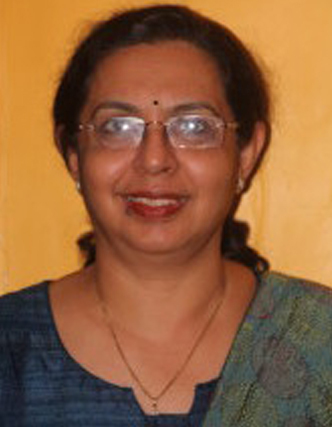 While the mandatory provision in the Companies Act, 2013 is groundbreaking, the key criticism against it, as is the case of mandatory quotas in general, is that earmarking a number of positions for women may, in the face of supply constraints, force companies to compromise on merit as a criterion for selection to the board in order to comply with the minimum requirements. This in turn may adversely impact company performance. It is also important to recognise that gender quotas by themselves, while necessary, may not be sufficient for impacting governance and performance. Extant research has shown that the impact of gender diversity in this regard is not straightforward and depends on other company characteristics such as the complexity of a company’s environment, the industry in which a company operates, and other board and director characteristics (Francoeur et al, 2007; Dobbin and Jung, 2011). Finally, greater diversity, including gender diversity, has its own pitfalls as mixed groups can lead to higher group conflicts, communication problems and increased costs of coordination, all of which can impact performance outcomes (Dobbin and Jung, 2011; Ferreira, 2010). The CNX100 companies that are examined in this note span across 38 different industries and belong to four major ownership groups, namely, government, group affiliated, stand-alone and foreign. Given the fact that these 100 companies are most actively traded on the bourses, these are of significant importance to shareholders, and therefore, represent an appropriate sample to undertake an analysis of the state of gender diversity on corporate boards. Figure 1 presents the trends in women’s participation on the boards of CNX100 companies in India for the period 2003-2012. We consider four categories of directors: male executive directors, female executive directors, male non-executive directors and female non- executive directors. For each company, we find the percentage of each type of director of the total number of directors on the board. For any year, the estimate for each category by gender is the average for the 100 companies in the sample. As is clearly evident from the figure, women non-executive and executive directors together consistently comprised less than 10% of total board members since 2003. While there have been year-to-year variations, the picture of gender diversity has remained more or less the same over the years irrespective of average board size, which ranged between 10 and nearly 13 over the study period. In other words, the high proportion of male directors on boards has been maintained despite increases in the number of board members, suggesting that additional board appointments were largely of male directors. A case in point is the spike in average board size between 2008 and 2009, where one can see that while there was a marginal increase in the percentage of female non-executive directors (from 4.26% to 5.10%), the corresponding increases for male non-executive and executive directors were much greater, from 66.52% to 78.56% in the case of the former and from 26.4% to 30.66% in the case of the latter. On the other hand, the percentage of female executive directors during the entire 10 years of our study has hovered around a miniscule 1%. As stated earlier, under the new Companies Act 2013, Indian companies are required to have at least one woman director on their boards within a specified time period. It is therefore important to undertake a status check, using data available for 2012, of the proportion of companies that currently meet this requirement and the magnitude of the task facing companies in complying with the legislation. We undertake this exercise for CNX100 companies. The results are presented in Figure 2. We classify sample firms by ownership group – government owned (22 firms), business group affiliated (56 firms), stand-alone (5 firms) and foreign owned (17 firms) – as per Prowess’s classification. We refrain from drawing too many conclusions about Indian stand-alone companies as they represent a relatively small group in the sample. We find that gender diversity in both government-owned and group-affiliated firms closely mirror the overall picture of more than 45% of companies having all-male boards with no significant difference between public sector and private business group-affiliated firms that dominate our sample. With regard to foreign companies, what is striking is that a large majority (around 70%) have all-male boards despite the fact that average board size is similar to that of group-affiliated firms. Using the requirement under Section 149(1) as the yardstick, Figure 2 reveals that a very slim majority (51%) of sample companies have at least one woman director on their boards, while almost half of the companies (49%) have all-male boards. Further, of the former category, very few companies have more than one woman director. The academic and empirical literature argues that gender diversity can positively influence monitoring and advising, which are the dual responsibilities of directors, and bring a greater diversity of perspectives to the board. Can appointing a single woman director on a board make a difference on these counts? Or does it just serve as a token compliance to the existing law? If we take at least two women on an average board size of 10 to be a benchmark for board effectiveness, then the estimates in Figure 2 suggest that Indian companies indeed have a long way to go to achieve meaningful diversity. Finally, we consider the incidence of gender diversity on company boards by examining the share of directorial positions occupied by women as a percentage of total directorships in CNX 100 companies. For this purpose, we consider separately the percentage of female directorships of the total directorships as well as each type of directorship – executive, non-executive and independent –held by women as a percentage of the total directorships in that type. Thus, the share of female executive directorships is computed as a percentage of the total executive directorship positions in our sample companies. We track the incidence of female directorships by type over the 10-year period, 2003-12, and present the estimates in Figure 3. Mirroring the low percentage of women at the board level, Figure 3 shows that the percentage of women at the directorship level is also relatively low, at less than 7% as of 2012. What is heartening, however, is that with the exception of female executive directorships, this percentage has been steadily increasing over the years for the sample companies, up from between 2-3% in 2003 to between 6-7% in 2012, with a significant increase occurring in 2006 and 2008 and plateauing thereafter. As with the presence of women executive directors at the board level, women’s presence at the directorship levels has remained constant at around 4% throughout the study period. Comparative estimates for the United Kingdom (UK) for the year 2010 (Davies, 2011) show that the percentage of female directorships in FTSE100 (an index of 100 companies listed on the London Stock Exchange) companies are much higher at 12.5%, with female non- executive directors comprising 15.6% of total non-executive directorships. The percentage of female executive directorships of the total executive directorships in India and the UK, however, is comparable at 3.31% and 5.5% respectively. Just as in most other countries in the world, including developed countries, women are under- represented on company boards in India. Indeed, the “leaking pipeline” problem is relatively more intense in this country. An analysis at the company level of a sample of 100 large Indian listed companies (CNX100) corroborates the macro picture of too few women on company boards, with the role of women directors largely confined to non-executive directorships. Even among these, only a small percentage of women are independent directors. 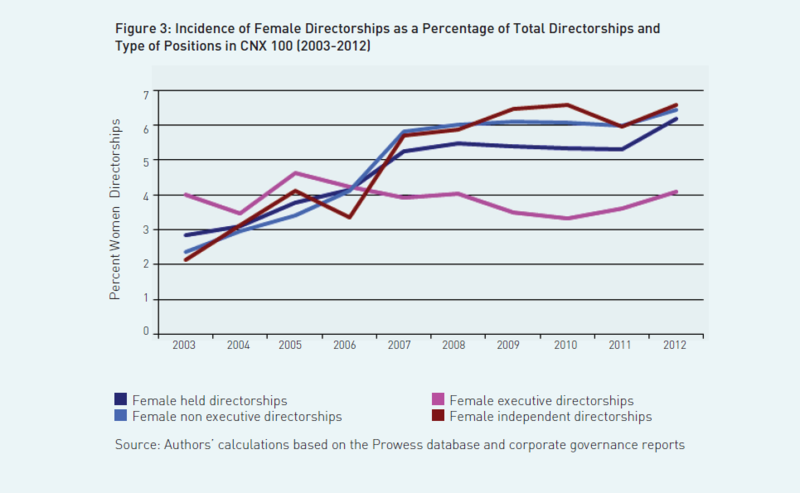 As of 2012, women directors occupied 6.17% of the total 1,231 board seats of CNX100 companies. A heartening development, however, over the 10-year period, 2003-2012, during which Indian listed companies strived to adopt best practices in governance, has been an upward trend in the presence of women directors as a whole, both as a percentage of board seats and of total directorships. An important finding of our analysis is that, as of 2012, nearly half of the companies in the sample have all-male boards, with some variation among ownership groups according to the number of women directors on board. These estimates suggest that a sufficiently large pool of women directors is needed beyond the existing pool to enable all the companies to comply with the requirements of the Companies Act in the span of a year or so. Thus, the magnitude of the compliance problem in the short to medium run should not be underestimated. The incidence of gender diversity in large Indian listed companies opens up several avenues for future research. Apart from examining micro-level differences in director characteristics by gender in terms of how they affect the performance of monitoring and advisory functions, what is perhaps most important from the point of view of sound economic policy is to establish a causal relation between women on boards and the various economic and non- economic outcomes. This calls for a full-blown empirical analysis using a multivariate approach that controls for different company-level and director-level characteristics to find out the marginal effect of gender diversity on corporate governance and performance. Hopefully, academic research will gather steam in this regard as the issue of representation of women on corporate boards moves to the centre stage in many countries, including India. Adams, RB and D Ferreira (2009). “Women in the Boardroom and Their Impact on Governance and Performance,” Journal of Financial Economics, 94(2): 291–309. Dobbin, F and J Jung (2011). “Corporate Board Gender Diversity and Stock Performance: The Competence Gap or Institutional Investor Bias?”North Carolina Law Review, 89(3): 809-838. Farrell, Kathleen A and Philip L Hersch (2005). “Additions to Corporate Boards: The Effect of Gender”, Journal of Corporate Finance, 11(1-2): 85-106. “Ferreira, Daniel (2010). “Board Diversity,” in Anderson, R and HK Baker (eds) Corporate Governance: A Synthesis of Theory, Research, and Practice (Hoboken: John Wiley & Sons), 225-242. Francoeur, Claude, Réal Labelle and Bernard Sinclair-Desgagné (2008). “Gender Diversity in Corporate Governance and Top Management,” Journal of Business Ethics, 81(1): 83–95. Professor in Economics at Indira Gandhi Institute of Development Research, Mumbai. Assistant Professor at Madras School of Economics, Chennai.